Tom – First, consider that we are living on a tropical island near the equator. 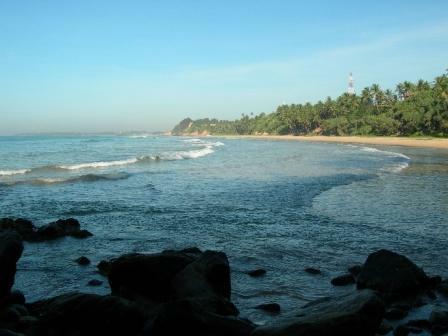 Matara is at the southern tip of Sri Lanka. We are on the beach but also on the edge of the jungle. Both temperature and humidity are very high. For example, today we will have a high of about 34o C (93 F) and a low of 27o C (80) with humidity ranging from 80-100% – and it is winter! Can you imagine when the SW monsoon begins in April?! Mosquitoes: The biggest problems are in the early morning and at dusk. Though there are some around all day. 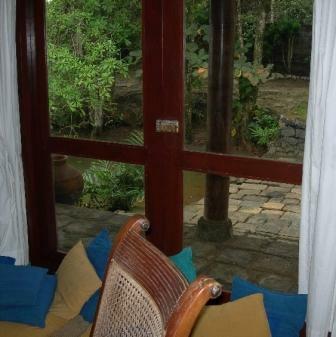 There are no screens in the windows or eaves between the walls and roof and we keep some doors open for ventilation when we are home, so they have free access to the house. We have an electrical mosquito zapper and a coil you can light to produce some repellent smoke, but there is really no way to eliminate them. We are actually very lucky because we are right on the beach and usually have an on-shore breeze, which blows them inland. As you know, we sleep under mosquito netting – though it is important you keep-out a lot more than just the mosquitoes! Ants: Big ones, medium size one, small ones, black ones, and red ones (those suckers sting!). We spray regularly but they just keep coming back. Spiders: The biggest ones (3 inches across) we have ever seen outside a zoo! I killed two in the bedroom a couple of days ago. Cockroaches: You have already read about some; we see big ones and little ones and are usually able to squash them before they get away. We have sprayed the obvious entrance areas and that has helped. Moths and “No See Ums:” We have your standard moths going in and out all the time as well as little no see ums. We’ve only seen a few butterflies. Flies: We can’t leave anything out anywhere or they will be all over the place. Bites/Stings: We get them everyday, especially around the lower legs and ankles (most bites could be sand flies from walking on the beach in the morning). Cortizone-10 is our constant companion. 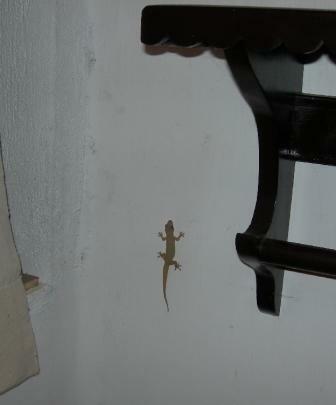 Lizards: We have at least one family of small lizards that share our house. I believe they live in the eaves or somewhere on top of the walls. Because we regularly see little piles of dirt in 2-3 spots even though we cleaned them the day before. We see our friends regularly scurrying on the floor, up a wall or ceiling. There are at least two adults and a child. 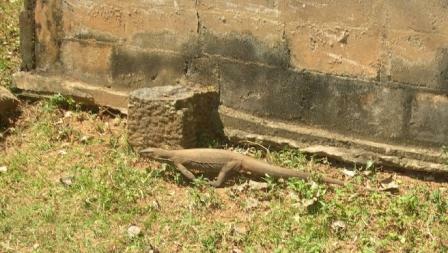 Helen – we have seen some giant lizards at an outdoor restaurant, by a temple, and going across our road…I mean Big!! About 2-3 feet long and thank goodness they are not in the house, at least so far!! Lightning Bugs: They occasionally fly in and out our bedroom windows at night and really look “cool.” They give off a bright white light unlike the yellow light we see from the ones in Ohio. Dogs: One walked in the front door last week, we chased it out. 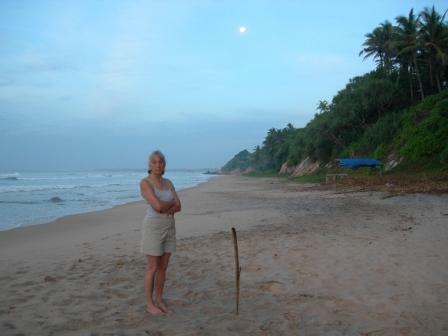 We carry a stick when we walk on the beach to ward them off. Most are small and scrawny and leave you alone but there is a pack of about five that sort of protect the one fishing boat from a small village that we have on our beach. The alpha female will occasionally lead a side or rear assault. We shake our stick at them and that stops them from getting too close. Helen – they also seem to pick on the lame ones and go after them with a vengeance!! At the hotel last night, there was a dog fight and the people there separated the dogs by hitting them with the plastic chairs!! Bats: We see them at dusk in our yard. So far none has entered the house. ??? : Something that felt cold and wet jumped on my back when I was rounding our house this evening; we had walked on the beach until the sun was down. I knocked it off with the slippers I was carrying but it was too dark to tell what it was. I went out with a light but there was nothing there. 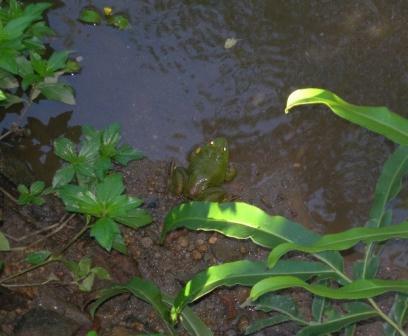 I am now writing this sentence two days latter and just saw a big tree frog in our pond – I bet that’s what jumped on my back in the dark! Birds: Lots of them. I’m not very good at bird identification but we have seen birds that look like egrets, kiwis, kingfishers, herons, pigeons, sparrows, black birds, sea gulls, a beautiful blue and turquoise one, etc. etc. 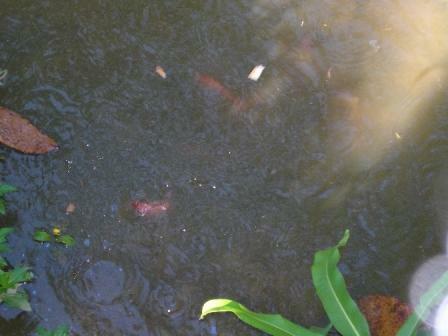 Fish: We have seen gold fish, minnows and frogs in our pond. 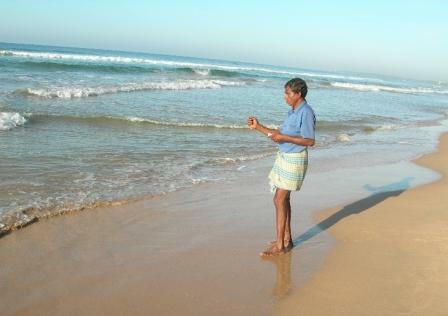 As mentioned earlier, we have seen the fisherman catch fish at our beach but I really don’t know how to identify them. We’ve seen lots of different fish coming off the boats in the harbors – the biggest ones so far being tuna. After breakfast we now throw bread crusts to the fish and frog, each day they get braver. Snakes: Have not seen any yet but we have found a big snake skin in our yard. Cows: Helen said she would write about the mother and baby cows we have in our front yard. Helen – LAWN MOWERS OR IS IT MOOOERS??? This morning we woke, not to the rooster as is the case most mornings; but instead, to mooing. 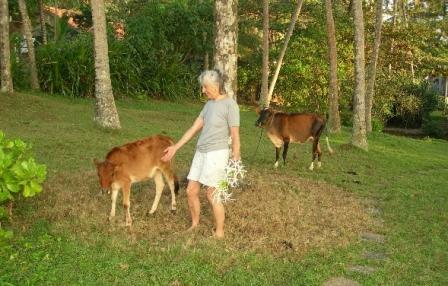 When we opened the deck door there were two cows (a mother and calf) tied to two of the palm trees “mooing” our lawn. As I mentioned before, they were in the yard next door (the smaller of the two rentals); I guess our lawn needed a trim so they moved them either last night or early this morning…that little one has a short lead and is always tying herself up around something. I think that she is my new pet!! Yesterday after Tom finished teaching and I working on the diary, we rushed downtown to a sport store recommended by the PE staff. It was located at the bus station on the second floor where half the shops were vacant. The Sport Zone was a really small store, maybe 10’x8’. They had a few swim caps, a couple of goggles, some balls, a few pairs of pants and shirts (we needed pants for teaching and there was not one in Tom’s size or the material he wanted, not to mention no woman’s clothing). The men here are much smaller in frame structure and this is a problem for Tom. I bought a swim cap because you have to wear one if you go into a pool. We went to three other sport stores and still nothing for Tom but I found two pairs of Columbia 70-30% poly-cotton material ¾ length pants to wear in my walking class. I had priced a similar pair (Columbia) in Dayton last year for $38 and now I paid $6, so I bought two pairs. We went to ARPICO (a store similar to Kmart on a much, much, much, smaller scale) and bought a chef’s knife (not to worry about me slicing another thumb because it isn’t that sharp) for $2, a 9×13 pan (I think I am going to try to make brownies!!) for $7 (that was expensive), some much needed hangers, sponges (you wouldn’t believe the cheap quality of sponges, lucky if they last two days!) and a comb and towel for the gym. It was getting dark now and that makes us nervous because there aren’t street lights so driving is even more hazardous if that is possible. We still had to go to Food City so I could cook something for dinner. Stocked up on some vegetables, some chicken thighs, and as we were leaving, Tom noticed Kraft Mac & Cheese…it is awful stuff and I never make it at home but we needed something quick so bought it. Tom was a happy camper with a not-spicy, slide down your throat food. I also breaded and fried zucchini slices and made a salad. After the dishes were done and the kitchen cleaned I was ready for bed before 9pm, Tom worked on lesson plans while I went to bed. No matter how many times you swim throughout the day, or how many showers you take, you still need a cool shower before going to bed just to get the sweat off. Then you get inside the net and under the fan and it makes you feel like you have air conditioning!! Today is going to be my first teaching day and I have spent the last couple of nights preparing handouts and lecture notes for the Fitness Walking Class, Tom will be on his second lecture for the instructors and his first for the weight training for students. I don’t know if Tom mentioned the weight room but it doesn’t have any aerobic equipment, just a few strength machines and some free weights. It makes our fitness center look fabulous!! He asked each student to bring his own towel to wipe down the equipment and to use as a neck pad for the weights. He had about 25 students attend; some even participated in street clothes and no shoes. He made a general announcement about proper attire. My class was held in the gymnasium for the first day; 17 students attended though several walked in between 15-30 minutes late. All girls for my class including the physics professor, Kanthi, Vinni, the only full time PE woman staff person who was a national speed walking and 400m champion in her youth (now 49) and Gnana an assistant PE instructor, office administrator, and tea maker (51). That made me the “over the hill grandmother” who out walked them all on the timed mile that day. The outside of the gym floor measures 16.5 laps for a mile or 1625m. I knew counting would be a problem so I gave them 16 tiny beans which they dropped into a dish at the end of each lap and then continued the final ½ lap to the finish. There is always one in every crowd and she dropped her beans!! The students will get a certificate of attendance if they make 80 % of the classes. I guess that this is important for them but we don’t understand why. Got home about 6:15 and went for a swim because both of our classes were god-awful hot. We don’t usually go swimming at this time and it was lovely with the setting sun and being the only ones on the beach (which is often the case anyway). Cooked chicken thighs (again!!) but this time had sautéed onions and potatoes with rosemary and the usual salad. Dessert today was a treat, two Fig Newtons each! I forgot to mention that this morning a man and his young daughter came to our driveway arch to pick the yellow flowers and the orange cluster flowers. They take these as offerings to the Buddha at the temple. I have seen them before and said hi but this morning I gave the little girl a couple of starburst candies…of course I had one myself!! Helen – yesterday Tom left me home alone while he went to work. I really thought I would have nothing to write about except something about his first presentation later in the day. However, after he left for work I decided to walk the beach by myself. I locked the front door, the kitchen door, and then closed the bi-doors at the back of the house toward the beach because the grounds keeper was working in the yard. Off I go, finishing up the first lap when I meet two male students from the university. We stop to talk, they have just finished running and I tell them about Tom’s presentation at 4:15. They think that they will be able to come and we go our separate ways…I continue toward one of the headlands and they in the opposite direction. As I get closer to the rocks, I hear them behind me calling me to stop. I turn around and they say don’t go past the rocks as it is unsafe by yourself. Some of the people there are not so nice. I thank them and decide maybe I will not do the second lap and walk toward home with them (the road runs alongside our house). I get home and go to open the patio door and find it is locked…the bottom locks connected when I slammed the doors closed. Darn!!! Lucky for me I left one bathroom window open (which I am not supposed to do, in fact, I am supposed to lock everything up and take the key, oops!). I had to move a potted tree out of my way, and then climb in headfirst while the other prickly plant ate me alive. The toilet was in my way but I managed. After I got in, I went back outside to replace the plant so the grounds keeper wouldn’t know what I did (we can’t communicate anyway) but as I replaced the plant the planter broke and now the plant and dirt were everywhere. The keeper comes around and wonders what I did; I look around for another planter, can’t find one but come back with a blue plastic tub. I try to put the plant in and then look for dirt (all I can find is sand)…meanwhile he replants the plant in double plastic bags, replaces the tub and shakes his head at me. I finished the sweater I was knitting and started my first cross stitch project. I can only do it outside because the light inside isn’t very good and the linen is a 28 count which I am doing in one thread over one thread. It says “season’s greetings” so I have lots of time to finish it. Tom came home for lunch (left over pasta salad) and then we got ready to go back for his presentation. The presentation was in the library conference room (tiny, dark, and crowded). The flyer said starts at 4:00 but in reality, it meant 4:30 and he had the Vice Chancellor (head of the university), the PE staff, a few faculty and about 30 students attend. He never did get his power point presentation from Wittenberg so did a whole new one over the weekend. It was well done using his computer to show the PowerPoint as he explained it. They don’t understand the American accent too well but they could read it all on his slides. He also had a marker board (pretty marked up until Kanthi brought the cleaner fluid and I got some extra paper and cleaned it). The man in charge of the room was supposed to have cleaned the board after Tom checked the room in the afternoon. Of course he didn’t and he was of no help before the presentation started. In fact Tom said the projector he had set up in the afternoon was so bad that Kanthi had to bring one from the Physics department. After the presentation, Kanthi and her husband Darme came back to the house for drinks on the beach patio until the sun set. This meant that we couldn’t go out for dinner (Tom is still hesitant with the glare from headlights on his new lens after the cataract surgery), so I reheated the rice from a couple of days ago, added some butternut squash and beans (not quite Caribbean rice) and were just happy that we didn’t have to go out and it wasn’t spicy. Tom’s three boxes, which he sent two weeks before we left through the U.S. diplomatic pouch, had finally arrived at the Fulbright office in Colombo. He was told that he had to pick them up (5 hour drive one-way!) 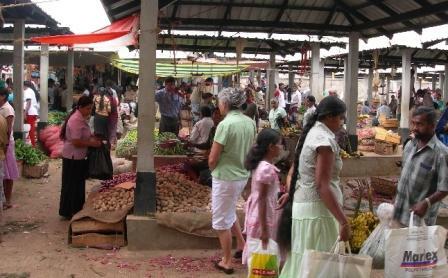 or perhaps someone we knew was making a trip to Matara. 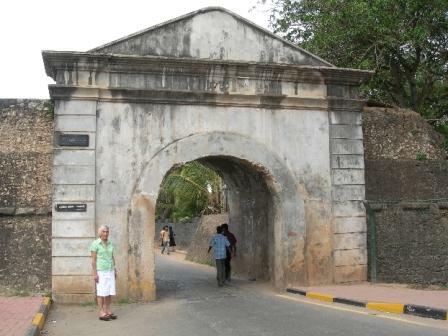 Lucky for us that Renata, the wife of the hotel owner from next door, went to Colombo yesterday for errands. Her husband Bobby came to our house and called her on the phone and she was able to pick them up for us…It was like Christmas opening up the boxes of books and professional materials we needed. Today Tom taught his first faculty course, 3 hours but he covered about 1 hour’s worth of his class material. Five faculty were there: Sarath (department Chair), Hewaruba (H.R. 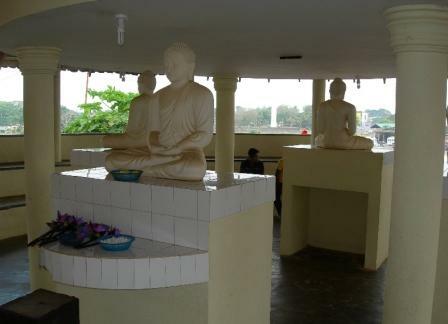 ), Palitha (Pali), Desil (Sunny), and the only female Vinitha (Vini). An assistant, Ghana, is also around. He said he had to speak slowly; they are used to British English. Also, he said he included information and anecdotes that are not normally part of his lecture because of their interest and questions. He presented in a section of the locker room that was cleaned up and set up with three tables, chairs and a marker board. No AC, no computer connection, in fact no fan!! They had a tea break about an hour into the session and brought a fan because Tom was dripping with sweat. I was working on my Fitness Walking class during this time. We went home for lunch and then returned for me to work on the computer while he worked in the weight room for tomorrow’s presentation. 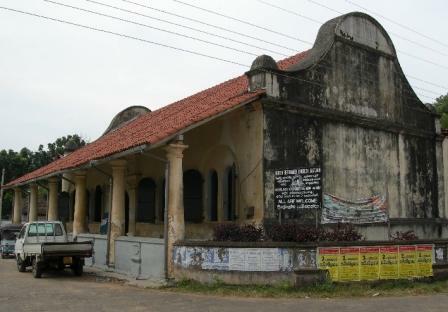 Tom – I went to the Matara branch of Hatton National Bank this morning to withdraw some money. They could not print the transaction on my savings account book because the branches outside of Colombo still do not have that capacity – so, they wrote it on a piece of paper for me. It was Monday and the bank was crowded. Even though they moved me right to the front of the line, it still took a half hour to get the cash. 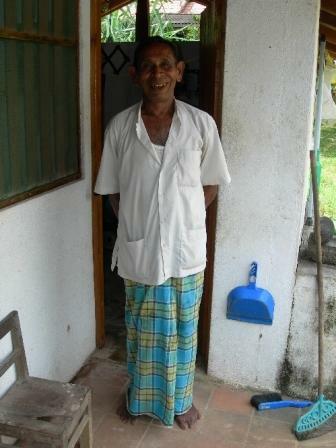 Sumathipala (caretaker/security) returned from his vacation today. He stays in a tiny room attached to the back of our house. He also cares for the house next door along with Leela. That will make us feel a lot more comfortable leaving the house. Helen – well, it’s Monday, Monday (mamas and the papas) and a new routine has begun. 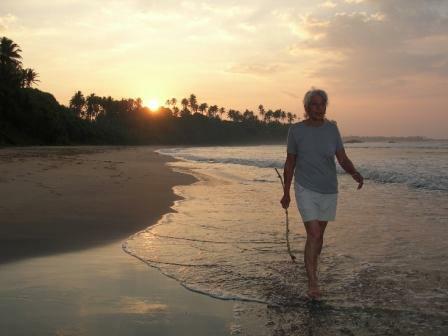 First, our walk on the beach at sunrise. After our walk, I threw in a load of wash…the machine is an LG brand: has four water levels; has four commands for progress, water fill, wash, spin, no spin; then four more choices for the type of wash, FUZZY (at the top), economy, something else, and wool. What is FUZZY??? I asked the lady at the hotel and she didn’t know either…so I used economy, set out my drain pipe and let it go to work. It didn’t wash for very long (economy!!) and some of the little stains didn’t come out but they smelled better. I can’t find a spray and wash pretreatment (had one in Colombo) in our Food City, so maybe I will have to look somewhere else. You have to hang the clothes inside out because the sun is so hot; it would cause fading. 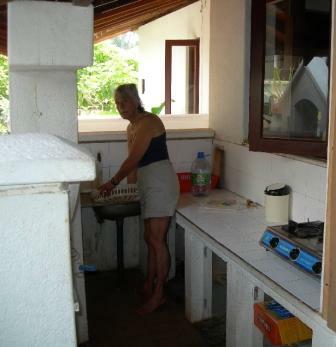 While the clothes were washing I did the breakfast dishes, then began to sweep the few rooms that we have. The floors are tile so it is pretty easy, except the broom is pretty nasty. Thank goodness one of the Fulbrighters who just left gave me some clothes pins and an iron. They call clothes pins “pegs” and I guess she had a hard time finding them. There was an iron on the pantry shelf that had spray and steam as well as duct tape on spots on the wire…you guessed it; it started to work and stopped so thank goodness for the spare. There is no ironing board so I folded a thin sheet on the table next to the washing machine and ironed there…had to devise a new method for shirts and dresses but I am wrinkle free for a change!! After all this work, I decided to go for a swim before taking a shower. Is this the life, or what!! Tom was inside working with the computer while I frolicked in the waves. Still can’t believe there are no shells on the beach, though this morning I saw two hermit crabs walking on the beach carrying their houses with them. Decided to try out the new hot shower… if you move the shower head just right, it doesn’t spray over the sink. Trade off is that you have to smack yourself against the wall to get sprayed…but most of the water now tends to make the drain in the shower stall. This water temp was heavenly for shaving legs!! While I was showering, Tom drove to the bank, filled the car with gas ($30) and got four more phone cards for $40…these have been going fast!!! I mentioned before that it is about $.15/min for the states and $.10/min here in the country. We are trying to use the house phone for in country calls but people here keep calling us on our cells. We went to the university dining facility for lunch today. You have to call before 9:30 to make a reservation…main reason, we were the only ones eating today, so he cooked for just us, go figure!!! It is a lovely facility at the conference center across the street from the university. Tom forgot to mention about the spices and could only eat two of the five choices served with the rice. Dessert was papaya, so ripe and delicious! At the university, our office was ready for Tom with a computer hookup, but my computer was not there so I am back in the lab. He is over at the computer center now trying to figure out what the problem is with Wittenberg and his email/files. Thank heavens he prepared a PowerPoint presentation on his computer and will be able to go over it in the morning at the library to make sure everything is ready for 4:00. He doesn’t have any idea how many are coming. Tom – I met with the ITs again this afternoon at the University of Ruhuna. It seems all my computer problems are related to their system (Surprise?). I am still unable to tunnel into the Wittenberg server with VPN Client to get my files – they need approval from the Sri Lankan “Computer Learned Society” in order to do this! The good news is that I can now access my Witt email after disabling the Ruhuna firewall. 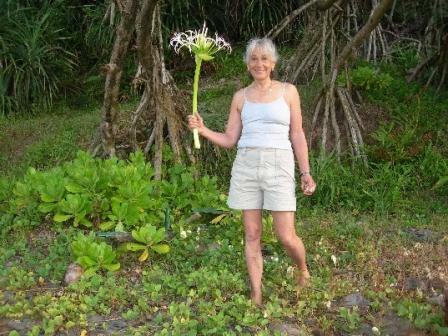 Helen – Tom and I walked one lap of the beach this morning so we could make church at 8. We got there about 10 minutes early, parked the car across the street and went inside. 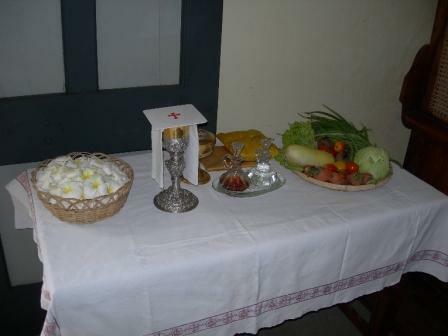 The first thing we noticed was the offering table which had, along with the host, a bowl of flowers, a wrapped package, and a basket tray filled with fresh vegetables. The people there were saying the rosary and they didn’t finish until 8:15 which in turn delayed the mass. The alter boys were dressed in Red robes and preceded the priest to the altar. Next (it was Children’s Sunday) the children all lined up in the back of the church dressed in school uniforms (girls wore white dresses with ties and the boys wore navy blue shorts and white short sleeve shirts); each child was carrying a flower and a present wrapped to give to the priest at the altar. Those who didn’t have presents had money envelopes, in fact, several adults also joined carrying envelopes. The church, St Mary’s, was quite lovely with 6 open arch doorways on each side. The Stations of the Cross were concrete painted reliefs positioned between the arches. There were also pew sections on either side of the altar. 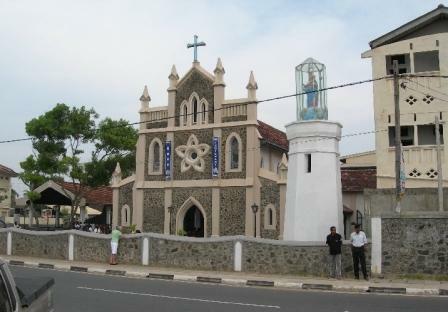 The interior was very similar to the cross shape of St. Theresa in Colombo. The walls where the people sat were painted a pale yellow, the altar area was painted pale pink and the inner altar area was painted pale blue. The entire mass was in Sinhalese so we didn’t understand a thing and I missed singing the lovely songs. Once again communion was given at the altar, kneeling and extending the tongue just like in the old days back home. The homely was at least 35 minutes if not longer and we were getting pretty restless. The entire mass took about 1:40. The farmers market sets up each Wednesday and Sunday, so we went there after church. It was very crowded and we went to just browse because we had already shopped yesterday. 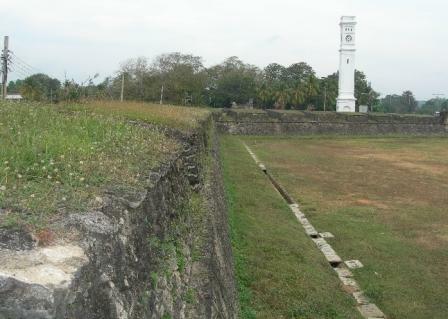 We continued walking behind the bus station to the old Dutch Fort built in 1780. There was a service taking place in an old Dutch Reformed Church inside. It looked like it was one of the buildings that survived the December 26, 2005 tsunami which took 1000 lives here. We found the “Little Dutch Restaurant” and ordered milk tea for me and coffee for Tom and had two vegetable buns…grand total of $1. There were some really old buildings in there, lots of residences, small businesses, and an army complex. It would be nice if they fixed it up. Leaving the fort we walked to the Buddhist Temple on Parey Duwa Island opposite the bus station. We had to take off our shoes and leave them with the shoe check man before climbing the stairs to the temple. A service was going on in the main building so we didn’t go in there. 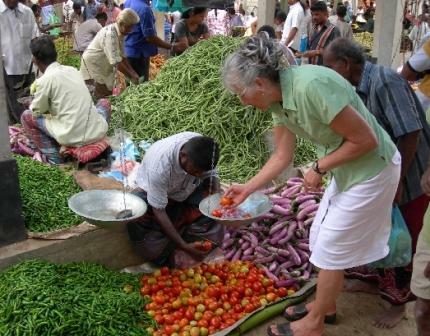 We returned to the market to buy some tomatoes and a strainer. Then as we walked to the car we passed a little bakery of sorts where the man was making those vegetable buns in a front window so we could watch. He started with a small ball of yeast dough and then slapped it around (like our pizza throwers) with his hand stretching it into a long oval. Put the vegetable mixture in the middle, then folded the longs side over the middle and proceeded to fold it into a triangle. He cooked them on the grill turning from front to back and then on each of the three sides. We bought one because the man spoke some English and said they weren’t too spicy…wrong, Tom had one little bite, I finished it and my nose started to run and I broke out in a cold sweat. Crossing the street we couldn’t find our car…first thought was that we had illegally parked and our car was towed. We were safe; we just didn’t recognize our own car. When we got home we went for a swim. It was cloudy and really windy so there were lots of waves. Tom worked on his presentation while I knitted, sat in the sun, and went two houses up to meet the German people (Hiki and her father) who are building a home for their vacation getaway. They even brought their electrician from Germany because they didn’t trust the locals. I made dinner which consisted of rice with sautéed onions and peas with cilantro, pan steamed/grilled chicken ¼‘s and tomato–onion salad. It’s really amazing that all I have to cook with is that three burner gas stove-top, an electric rice cooker, an electric teapot, and a really small oven which I have only used for toast. Tom – I was supposed to again work on the Wittenberg connection problems at the university but I have lost patience. I spent most of the day at home doing my Power Point presentation from scratch. It won’t be fancy but I should be able to cover my bases. Helen – HAPPY BIRTHDAY TO ME!!! We decided that today we would not go into the university so I thought it would be a “nothing new to write home about day.” Wrong!! First – someone stole my boogie board!!! Boy was I mad this morning when we went out for our walk and found someone had taken it from inside our gated back/beach yard. I hope that they enjoy it and you know that I will be watching to see if someone is using it!! Second – also on our walk we noticed a little old lady with a big bag of something on her head. She was walking toward the east rock headland for our beach (it is a natural rock area). 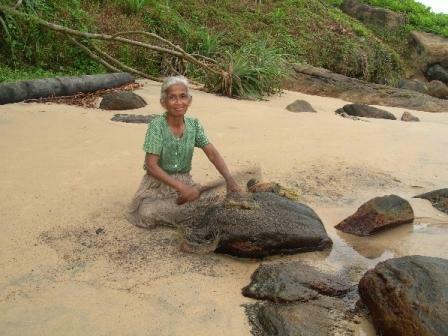 When we made our second round we noticed she was sitting in the water with her long skirt all wet digging for something and moving these rocks around. We walked up closer and she begins talking to us but of course we can’t understand a word. 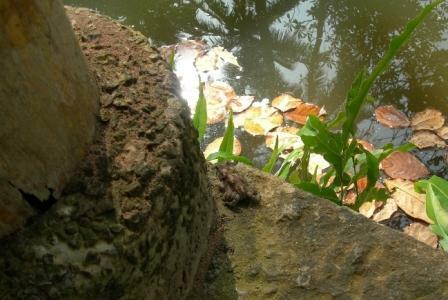 Tom assumes that she needs some help, so he starts to gather some rocks from another area and she motions him “NO,NO.” It seems that she is burying coconut shells in the mud and then piles rocks on them so the water won’t take them away. Tom was going into another cache. After she finished burying the shells, she went to another area and started digging up shells which she had buried days before. These were pretty black looking and decomposed. She ripped the bark off then took the fiber bundle and pounded it with a stick on a rock until it separated and spread apart. Then she took this and washed it in the water to get all the dirt out and laid it next to the bag to take home. Ok, now that I knew what she was doing, I just jumped right in there and started washing the fiber bundles, wringing them out, and piling them up on the rocks. The second round I had the job of stripping off the barks and washing the fiber bundles. She then showed me how she twisted the fibers to make rope and indicated that the rest of the fibers would be made into brooms. While I was working, Tom went back to the house for the camera (first morning he didn’t bring it with him) and she kept talking to me like we were best friends. A man that we met on the beach a few days ago walked over to us and he translated for me. I told her I would see her in a few days. 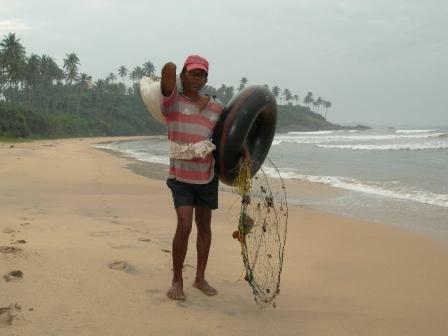 Local reef fisherman, floats on his inner tube and nets fish, crabs, etc. 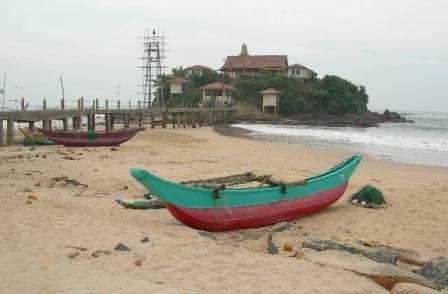 Third – I forgot to mention that yesterday on our walk we saw a fishing boat come up on shore. 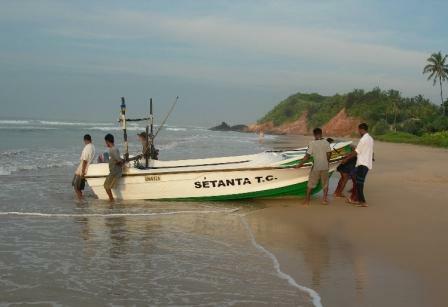 There were several men waiting for them because they needed help pulling the boat up on the shore. We stopped to see what they caught and Tom took their picture then we helped them with the boat. It was really heavy because it was wood and it had an outdoor motor on the back. They offered to sell us a fish for $2 or $4 for a kilo…since we didn’t know what kind of fish it was, we declined. 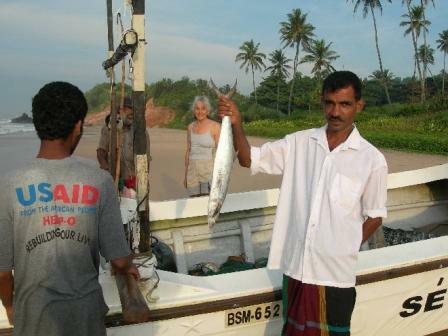 A lot of the fish caught are only good for curries or stewing, not for grilling. 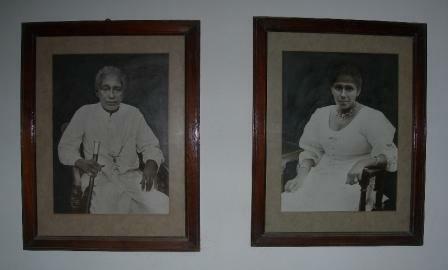 Fourth – Kamala (surrogate landlady), a young newly ordained English teacher for translation, accompanied by a workman came to do some required chores. The workman was to fix the toilet that wouldn’t flush, to install a hot water system for one bathroom, and fix the fan in the dining area which only had 1 speed, very slow. The shower situation got a little tricky. Most of the bathrooms have a little hot water tank in the bathroom and you put on the switch about 10 minutes before you need hot water. Remember we have three bathrooms, two that are enclosed and one that has no ceiling (just a few wooden slates across the top). You can guess which one has the only electrical outlet. We said, we didn’t think it was a good idea to put the hot water in there, because during the rainy season who will want to take a shower in that bathroom?? They said that the owner specifically said that was the correct one. They called him back and worked it out. Are you ready for the solution??? They put in another shower head in the covered part of the bathroom, but now the water will splash over the sink, toilet and the whole floor will get wet. You got it, no shower curtain over there and the shower stall still remains. Fifth – this fellow was also supposed to fix the ceiling light by the front door so that when you come into the house you have light. He replaced the bulb and then we discovered that it blinks on when someone rings the doorbell. Can’t people hear the bell? Do they need a light to signal it as well?? Sixth – I decided that our beach needed an environmental clean-up. I cleaned up the plastic bags, plastic ice cream spoons, toothbrushes (we often see the villagers brushing their teeth on the beach, go figure) paper, and just general debris. When I got close to our wall, I found a long; I mean long, snake skin. It really freaked me out!!! Seventh – we decided to go swimming again and noticed that there were lots of boys and girls down at one end of the beach. First we thought that they we pulling the fishing nets in…when Tom checked it out, seems they were from the university having an initiation ritual from one of the departments. 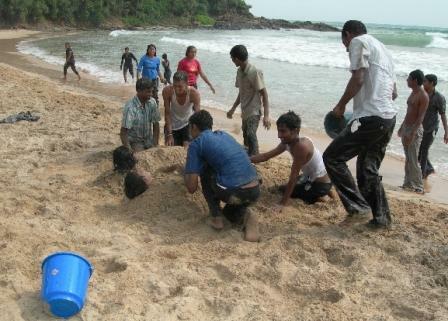 Girls and boys were fully clothed, playing with a ball in the waves, throwing each other into the waves, burying people in the sand and throwing sand all over one another. Eighth – I walked over to the hotel to have a look. Renata (Polish) and her husband, Bobby (Sri Lankan) who live in Switzerland have just finished building the hotel. I mentioned it was too bad that we didn’t meet a few days earlier and missed the party. She replied, yes it was. They didn’t send out invitations, just told everyone to come over and we should have just stopped in. Anyway, this hotel is really nice…the rooms are quite large, each with a private bath, big windows overlooking the ocean because they are on a hill, and comfortable new mattresses (this is really unusual). The lobby is an outdoor area under a roof, as is the restaurant area. One balcony will be having a billiards table, and eventually there will be a Jacuzzi on the rooftop. Bobby’s brother Luke will be taking care of the hotel when they are in Zurich. 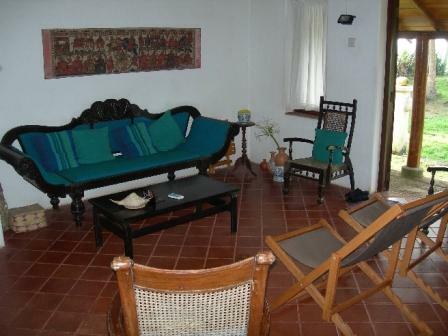 The rooms are now renting for $20/night…remember that I told you that some of the top hotels in Colombo were renting for $75-80/night. They plan to bring in tourists from Switzerland. About half the cost of flying in from the U.S.
Ninth – We needed to go back into town to grocery shop and see when Mass was for tomorrow morning. The Food City was packed and the parking area isn’t very large. We noticed a policeman in the lot when we arrived and thought he was for security. When we came out, he was directing traffic in the parking lot and telling you how and where to park. OK, they really needed it with the three-wheelers, motorcycles and cars all trying to squeeze in there. Tenth and Last – Tom took me out for dinner in the little restaurant next door to the hotel and behind our house. We had asked them to cook for us earlier in the day: wanting grilled fish (rockfish which has lots of meat and few bones), vegetable rice, and potato curry. It was delicious. The fish was not grilled but steamed in foil and nicely seasoned. We brought our own beer and as I am writing this, Tom is sleeping on the bed in the study. I had a great day but really missed my family and friends on my day!! Tom – Horrendous computer problems! I have been trying to connect to the Wittenberg server for three days in order to get a Power Point presentation I am supposed to give to the entire university on Tuesday and have been unable to do so. I emailed the various error messages to Wittenberg. I called them several times but was not able to get any assistance. I finally made a contact with Rick (1am our time) and he said he would get them moving. So this morning I get an email from Scott giving me three separate instructions – none of them worked! Meanwhile the computer techs at U of Ruhuna are trying but unable to help. Now compound this with Wittenberg email problems and I am about ready to pull out the last of my gray hair! After several tries, I am able to get to my Witt email but I am shortly timed out, or if I do any operation e.g. open a different message, delete a message, click reply to a message, etc., I am kicked out and have to log in 2-4 times again just to get back to where I was! 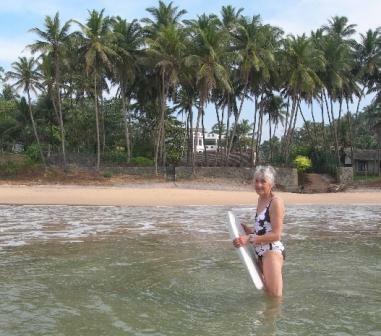 Helen – This morning after our walk on the beach (which we now guesstimate is 1.3 miles round trip) we went boogie boarding because we found an old one on top of the refrigerator. Tom had trouble with his knees when he got to the shallow end but I had a few really good rides…wish I were 20 again and could try surfing with the young couple from Australia and New Zealand who are here on summer break. I think that I mentioned in the previous email that the new hotel had its grand opening last night. We saw them preparing all day and wondered who would be attending…wish we knew in advance because they partied until 3am and since we couldn’t sleep we could have joined them…there is a dirt one lane road separating us and they look into my outside kitchen. We shut all the doors and windows but the eves are open so we felt the band and the loud speakers were in bed with us. We were pretty ticked and were going to complain this morning when the surfer couple on the beach said that the party was for the workers who just completed the work. Since they are renting next door to the hotel, they went over to investigate and were asked to join the party for free food and drinks…once again we missed a great opportunity!! TGIF and hopefully the computer network will be set up in the house and we will be able to work from there. This week Tom has a major university presentation (whcih he is still having trouble accessing from Wittenberg though he called the university at 1am our time since the party was keeping us up!!) and both he and I begin teaching classes this week which I have already explained in the up coming sequel. Helen – Well almost…I just wrote about last night and today and was getting to the last three lines when the computer lab lost power – and I lost my diary!! Now I know that I have to save every paragraph so I won’t get caught in this predicament again!! I will now try to remember what I wrote but I have to admit my frame of mind is not the same as it was a few minutes ago. Last night when we returned to the beach house the workers were still there cleaning (??) and getting ready for us. 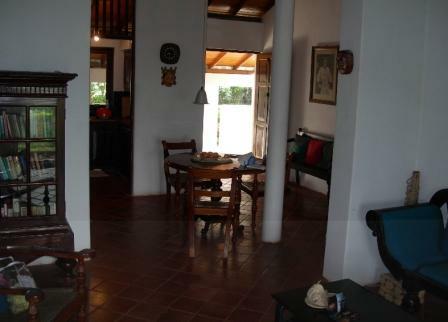 We had spoken to the owner (whom we thought was here in Matara but is in fact in Colombo) and he said that we were free to use anything we found in the house. Well, when we returned, they had left the bare essentials (dishes, utensils, glasses, clean sheets on the bed) and removed everything else (towels, food, spices, pots and pans, and cleaning essentials). We called the owner again, must have spoken to him at least 8 times because the helpers don’t speak English (except Kamala who knows very little and has trouble with our American accent). He said to go over to the 2 bedroom bungalow where they had taken the stuff and take whatever we wanted. So we got pots and pans, towels, more sheets but no spices, etc. We were glad when they all left and we could reorganize things ourselves. We were pretty tired since we had been up since 4:30 that morning but we unpacked a few things to get ready for bed. I washed the wardrobe down which is in the second bedroom and aired it out. This bedroom has two single beds. All the beds have massive carved feet about 12” off the floor, a solid wood base (full or twin) and a foam mattress. 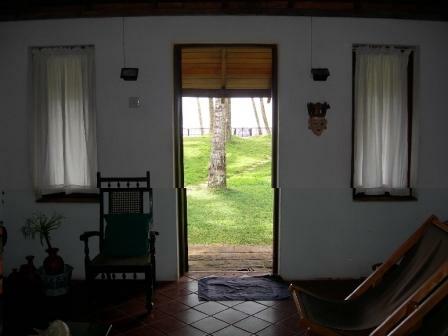 This room has two windows with one facing the beach, and one outlet. I decided to use this room as my dressing room and spare room for suitcases, etc. It also has a small bathroom with a shower stall and we will be using it for a guest room (Ruki our guest house owner promises she will visit) when/if we have company. Meanwhile Tom was organizing his office and getting the phone line working. Our room has a larger bathroom with shower stall, a double bed, small dresser and clothes rack on the wall (both Tom’s). I noticed that the mattress was pretty lumpy. So we took off the sheets and turned it over, put two bottom sheets on and then remade the bed. It was much better now except it creaked whenever we turned or moved. We took cold showers tucked ourselves under our net and went to sleep. Today – We woke up about 6:15 and could hear the waves rolling in. After getting ready for our walk (I was finally able to wear shorts and tank top since we were on the beach) and then opening the patio doors – our breath was taken away! The back yard slopes down to the gate which leads to the beach and is full of tall leaning palm trees. The stepping stones make a curved path to the gate and both sides of the yard are planted with flowering shrubs for privacy. To the right of the stepping stones at the base of the patio is a large pond and then the landscape slopes up toward the beach to another concrete patio with concrete picnic table and chairs, a concrete structure which resembles an outdoor grill of sorts without the grill, and then a wooden slat platform deck for sunning or sitting and watching the ocean from a height. There are outdoor lights along the fence and on the patio for evening entertaining. We went down the stepping stones, opened our gate and walked the crescent beach which is about 0.67 mile in length. At each end of the beach are small rock headlands and then beaches on the other side of them. We walked our beach and looked for seashells but none were to be found except for a few broken fragments. In one tidal pool we did see one sea urchin and some small crabs scurrying sideways. We met two runners and a couple of fishermen; and saw two little boys squatting on the beach near the foliage having bowel movements. You would be proud of us because we did not take a photo!! They just continued doing their business as we walked past them. After our walk, we had breakfast on the patio at the picnic table. It was nice to be by ourselves for a meal, the first in three weeks, without someone looking over us or having to make conversation. We just had Total with bananas and finally low fat milk, orange/cranberry juice (after mango for two weeks), coffee and mandarin oranges. 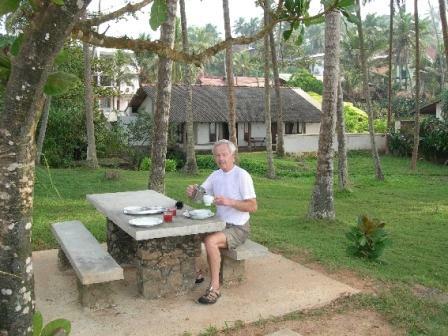 The breakfast was simple but the view magnificent. Back to the real world of doing dishes and cleaning up (didn’t miss it for the last three weeks!). Worked on cleaning the kitchen some more and washing the inside of cabinets and shelves because we were going shopping later. After cleaning the kitchen I began putting clothes and things away and trying to get organized. I had to rewash the wardrobe and lined the shelves with plastic shopping bags before putting my clothes on them. This took several hours and by that time I was getting sweaty; what better excuse to go into the water for a swim. 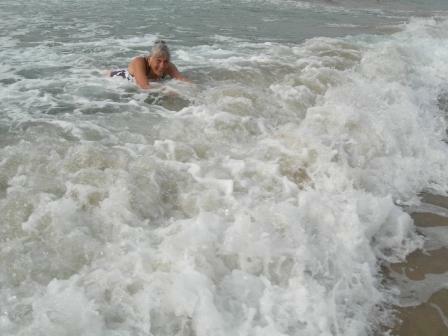 The water was really warm and the waves had a gentle roll to them. I stayed about 40 minutes and then came inside for another cold shower; I have to admit it really wasn’t all that bad if you turned the water on quickly to get wet, then shut it off while you suds up, then turned it on again to rinse, turn it off again while you shampoo your hair, turn it on again to rinse, and most important is to shave your legs outside of the shower!! Couldn’t use the hair dryer again because the outlets are different which means we will get another adapter. Got dressed and was ready to go shopping and to the university. While I was doing all this, Tom was still working on his office. By the time he showered and dressed it was noon, so we had to look for something to eat on the way. We found a bakery just down the street on the main road and got a fish and potato pastry, a hard boiled egg pastry, and a sugared bread roll. We ate it in the store and will probably return for those fish pastries because they were actually good even though they sound gross!! On to the dialog phone store again…the instructions are terrible and Tom needed help for a few functions on our phones. Across the street there was a little store which sold our KIT card for the phone minutes (we are going through them like hotcakes). It is just five cents cheaper to call locally than it is to call the states and like home they charge for in-coming and out-going calls. Thank heavens we now have a house phone, so people can call us here first before calling the cells. Next stop was the local green grocers on the circle in the middle of town. Their prices were higher because we were foreigners so we returned to the Food City where everything is labeled and pretty cheap except for juices, soda, and other imported things. I will include a quick price check for the few things we bought. Beer was cheaper than soda and better for you with the electrolyte content…so, I am getting to like beer! The Sri Lankan Lion Lager Beer – 625ml, 4.8% alcohol, cost $0.75, $0.23 bottle deposit, for a grand total of $0.98 – and it’s good! Nescafe instant coffee is about $4 for 100g (boy do I miss my café lattes), lowfat milk is $3.80 gal, mandarin oranges are $.63/lb, leaf lettuce $.63/lb, tumeric powder 100g for $.38 (this is the greatest bargain), limes $.27/lb, tomatoes $.30.lb, basmati rice $. 50/lb, and dried garbanzo beans (I always bought them in a can) $.70/lb. So tonight I was going to cook Syrian eggplant mousacca. We loaded the non perishables into the car and headed for the university. Tom is getting to be pretty good at driving and honking his horn and passing in that invisible middle lane. I had to help him with his parallel parking on the busy street by getting out and telling him how close he was to the motorcycles parked behind him. People were looking at us a little strangely, but hey, we didn’t want another motorcycle accident!! At the university we looked at an office in the physics building which they are going to set-up for us. This building is better for us because they have better computers and Kanthi’s (the physics professor who is Chair of the Sport Advisory Board and speaks great English) office is nearby. The room is presently a disaster area used for storage but will be cleaned and will have two desks for us by Monday or Tuesday. So I went back to the lab where I worked and Tom to Kanthi’s office where she had a faster internet connection. I was working on this email and just got to the point where I was ready to sign off when the power went off and I lost my document. I was beside myself and the student sitting two seats down just looked at me in astonishment. I asked her did I lose everything and she replied yes if you didn’t save it. You have to save every few minutes in case this happens. Then I remembered telling you about the power outages when we needed our headlights and could have kicked myself for forgetting. I figured I may as well go to Kanthi’s office but couldn’t find it. I walked around and up and down some stairs and kept passing the same two students sitting near by. I just looked like I had forgotten something and walked back to the lab, well, couldn’t find that either. Next plan of attack was to find the car and go from there; thought I saw it and took a short cut across some grass which then took me up this hill, through some bushes and brought me back to the same two students. They looked at me pretty funny so this time I asked them for directions except I couldn’t remember Kanthi’s last name and they didn’t speak English. They started rattling off some names and I recognized hers. They took me to her office and I couldn’t wait to get home. Anyway, I am writing this at home and will copy and paste tomorrow. Coming home I was ready to cook dinner and see how I fared. First I had to scrub the wok and little pan because whoever used them last left them dirty and crusted. Then I had to Clorox the lettuce, rinse it with cold boiled water and let it drain (no spinner), Clorox the eggplant, the tomatoes, the limes, the oranges; forgot that I first had to rinse and sort the garbanzo beans and start cooking them because I had no idea how long they would take. Back to the meal, fried the eggplant, then the onions, added the tomatoes, returned the eggplant back to the wok and cooked it on top of the stove (usually bake in oven for about an hour) to simmer. Now remember that the prep was done in the inside kitchen and the cooking in the outside kitchen, did a lot of running back and forth to stir and prep. I think that I will start getting used to prepping and cooking outside. I had hoped to eat outside on the wooden patio but it was already dark by the time I finished. Tom enjoyed eating without worrying if it was too spicy and I loved having salad again. After cleaning up, I sat on the wall and watched the white waves roll onto shore in the dark until Tom was ready to let me have the computer. We thought this was going to be a peaceful place…we have no TV (and had just installed cable for our renters back home), no radio either BUT a new hotel open for business today and they are having a party with loud music. I hope this doesn’t happen every night. I won’t be writing for a few days because I have to prepare for my walking class so you will have a reading rest from this diary/novel. I am trying to beat Michener for volume!! You are currently browsing the The Martin's Blog blog archives for January, 2008.